Yesterday was one of my favorite kind of days. We spent almost all of it, not only outside - which is good, but in the garden - which is great. We have had this garden for eight years. In those eight years we have done a lot of work to improve it, and to make it easier to work with. I can tell you that the hard work has really paid off. Yesterday I was able to get all the beds, save two, ready for planting. One of them I just didn't get to because I was getting a very sore throat and the other needs to have its side fixed. It used to take ages to get them all ready for planting so this was quite exciting to me. I am a big fan of garden beds, I love that there is no need for tilling(and the worms love this too), the soil does not get compacted from walking on, the pathways are easy to see and stay on (for kids and dogs). I love the way the beds look and I love how intensely they can be planted. Over the last few years I have been trying to do some mulching a la Ruth Stout style - except with grass clippings or leaves because they are free and readily available to me - and this seems to have paid off too. I have way less weeds out there right now then I would normally have. I remember when I first moved in here, I would go to bed at night and see an imprint of a Hairy Crab grass weed on the back of my eyelids because I had been staring at it all day while trying to pull it all out. 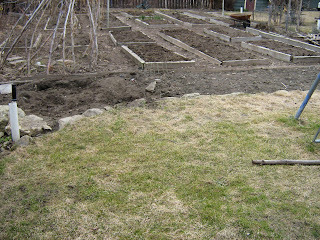 So the beds are ready and now I just need to get out there and plant. Hey! We did the same thing yesterday! I love your garden. This is only me second year with my garden and there was no garden at all where I have created mine. Looking forward to seeing your garden magic this growing season, Heather! Your talent for growing and caring for plants is amazing.